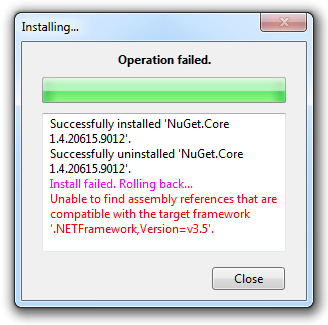 I can't use the NuGet.Core library in my new module until our current vendor either updates the solution to target the .40 framework or I figure out a way to get around this hurdle. I don't think I can safely just change the build target on the solution since it's precompiled... hmm. Once I figure that out, I'll move onto the other problem. The system is still using jQuery 1.3 (circ. 2009). Yes, jQuery 1.4 was released at the beginning of 2010, 1.5 at the beginning of 2011, and 1.6 was just released last month. I'm beginning to understand why President Roosevelt uttered the words "the only thing we have to fear is fear itself."